Grenoble (;French pronunciation: ​; Franco-Provençal: Grenoblo) is a city in southeastern France, at the foot of the French Alps where the river Drac joins the Isère. Located in the Rhône-Alpes region, Grenoble is the capital of the department of Isère. The proximity of the mountains, as well as its size, has led to the city being known in France as the "Capital of the Alps". Grenoble grew in importance through its industrial development, the city having experienced several periods of economic expansion in the last centuries. It started with its booming glove industry in the 18th and 19th centuries, continued with the development of a strong hydropower industry in the late 19th to early 20th centuries and ended with its post-World War II economic boom symbolized by the holding of the X Olympic Winter Games in 1968. The city is now a significant scientific centre in Europe. The numerous communes that make up the metropolitan area include the city's largest suburbs, Saint-Martin-d'Hères, Échirolles, and Fontaine, each with a population exceeding 20,000. The first references to Grenoble date back to 43 BC. Cularo was at that time a little Gallic village founded by the Allobroges tribe near a bridge across the Isère River. With insecurity rising, a strong wall was built around the small town in 286 AD. Christianity spread to the region during the 4th century, and the diocese of Grenoble was founded in 377 AD. From that time on, the bishops exercised significant political power over the city and, until the French Revolution, styled themselves the "bishops and princes of Grenoble". After the collapse of the Roman Empire, the city was part of the first Burgundian kingdom in the 5th century and the second Burgundian Kingdom of Arles until 1032, when it was integrated into the Holy Roman Empire. Arletian rule was interrupted between 942 and 970 due to Arabic rule based in Fraxinet. Despite their status, the Counts had to share authority over the city with the Bishop of Grenoble. One of the most famous of those was Saint Hugh. Under his rule, the city's bridge was rebuilt, and both a regular hospital and a leper one was built. In 1336 the last Dauphin Humbert II founded a court of justice, the Conseil delphinal (fr), which settled at Grenoble in 1340. He also established the University of Grenoble in 1339. Aging and heirless, Humbert sold his state to France in 1349, on the condition that the heir to the French crown used the title of Dauphin. 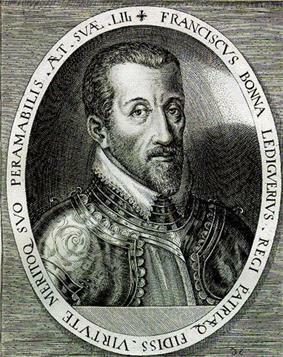 The first one, the future Charles V, spent nine months in Grenoble. The city remained the capital of the Dauphiné, henceforth a province of France, and the Estates of Dauphiné were created. ^ Graff, James (22 August 2004). "Secret Capitals". Time (New York). Retrieved 29 October 2009. ^ Pentland, William (9 July 2013). "World's 15 Most Inventive Cities". Forbes (New York). Retrieved 16 July 2013. 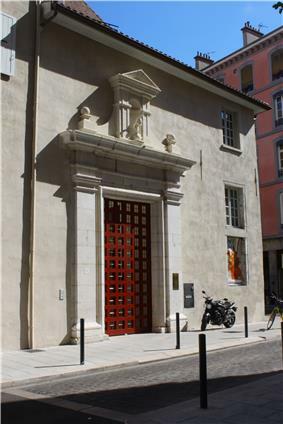 ^ "Musée Dauphinois". Metrodoc.la-metro.org. Retrieved 12 May 2010. ^ "Il y a 250 ans naissait Joseph Chanrion (1756-1830)". Union de Quartier Mutualité-Préfecture. ^ "Meteo France: Climate in France". ^ "Bienvenue sur www.bastille-grenoble.com". Bastille-grenoble.fr. Retrieved 2014-04-09. ^ "Tourism office - patrimoine religieux". Retrieved 14 March 2013. ^ "Présentation PowerPoint" (PDF). Retrieved 29 October 2009. ^ "Pôles de compétitivité". Mairie de Grenoble. ^ "Chiffres clés Grenoble-Isère édition 2011". AEPI. ^ "Official website of the GIANT Innovation Campus". Giant-grenoble.org. Retrieved 2014-04-09. ^ "European Institute of Innovation and Technology: Home". Europa (web portal). Retrieved 12 May 2010. ^ "Les Les entreprises récompensées". Grenoble.cci.fr. Retrieved 2012-07-26. ^ a b c d e f g h i j k l m n o p Jérôme Steffenino, Marguerite Masson. "Ville de Grenoble – Coopérations et villes jumelles". Grenoble.fr. Retrieved 16 May 2013. 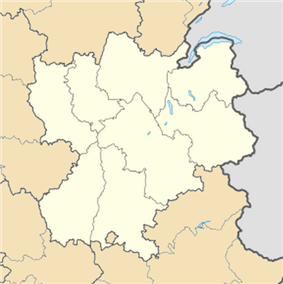 ^ "List of Twin Towns in the Ruhr District". © 2009 Twins2010.com. Retrieved 28 October 2009. ^ "Oxford's International Twin Towns". Oxford City Council. Archived from the original on 2013-08-17. Retrieved 2013-09-03. After World War I, one street in the centre of Smederevska Palanka (Serbia) was named French street (Francuska ulica) and one street in Grenoble was named Palanka street(Rue de Palanka). There is also a Belgrade Street (Rue de Belgrade) near the Isère River. The town also hosts an important comics publisher, Glénat. Grenoble is known for its walnuts, Noix de Grenoble (fr) which enjoy an appellation of controlled origin. The main cultural center of the city is called MC2 (for Maison de la culture, version 2), which hosts music, theater, and dance performances. The Summum is the biggest concert hall in Grenoble, and the most famous artists produce there. Another big hall, Le grand angle, is located nearby in Voiron. Smaller halls in the city include the Salle Olivier Messiaen. Grenoble hosts several festivals: the Grenoble Jazz Festival in March, the Open Air Short Film Festival in early July, and the Cabaret Frappé music festival at the end of July. Since 1 October 2014, the city tested 70 electric vehicles to rent (I-Road of Toyota). A partial ring road around the south of the city, the Rocade Sud, connects the motorway arriving from the northwest (A48) with that arriving from the northeast (A41). A project to complete the ring road with a tunnel under the Bastille as part of the likely routes was rejected after its environmental impact studies. Grenoble can be accessed by air from Grenoble-Isère Airport, Lyon Saint-Exupéry Airport and Geneva International Airport. The Gare de Grenoble is served by the TGV rail network, with frequent high-speed services to and from Paris-Gare de Lyon, often with a stop at Lyon Saint-Exupéry Airport: though Grenoble is not directly on any high-speed line, TGVs can run on the classic network and enable such connections. Less frequent high-speed trains run to and from other destinations in France, such as Lille Europe and Nantes. Local rail services connect Grenoble with Lyon, and less frequently to Geneva and to destinations to the West and South. Valence and Lyon to the west provides connections with TGV services along the Rhone valley. Rail and road connections to the south are less well-developed. Within Grenoble, a comprehensive bus and tram service operates 26 bus routes and five tram lines and serves much of greater Grenoble. Being essentially flat, Grenoble is a bicycle-friendly city. The abundance of natural sites around Grenoble as well as the particular influence of mountaineering practices and history make many Grenoble inhabitants very fond of sports and outdoor activities (e.g., mountain trails hiking, mountain bike, backcountry skiing, rock climbing, and paragliding). The Tour de France cycling race regularly passes through the city. Six-Days of Grenoble, a six-day track cycling race since 1971. Grenoble is the home of a rugby union team, FC Grenoble, a football team, Grenoble Foot 38, and an ice hockey team, Brûleurs de loups. Grenoble hosted the 1968 Winter Olympics. The city is famous for many nearby ski resorts nestled in the surrounding mountains. Stade Lesdiguières is located in Grenoble and has been the venue for international rugby league and rugby union games. Publisher Glénat has its head office in Grenoble. The presence of companies such as HP or Caterpillar in the area has drawn many American and British workers to Grenoble, especially in the surrounding mountain villages. The region has the second largest English-speaking community in France, after Paris. That community has an English-speaking Church and supports the International School. The town was famous for glove manufacturing, for which Xavier Jouvin (fr) introduced an innovative technique in the 19th century. A few small companies keep producing gloves for a very high end market. Grenoble is one of the leading European cities in term of high-tech industries, especially biotechnology and nanotechnology. World-renowned enterprises have settled in Grenoble and in the surrounding area such as Hewlett Packard, Caterpillar, and STMicroelectronics. 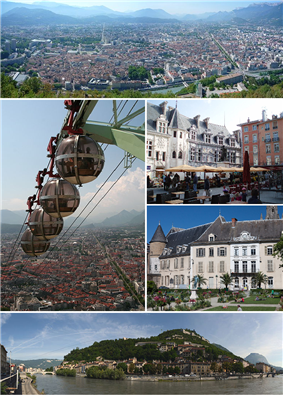 Since 1993 Grenoble can be considered as an international city thanks to the World Trade Center of Grenoble. In order to foster this technological cluster university institutions and research organizations united to create the GIANT (Grenoble Innovation for Advanced New Technologies) Innovation Campus with the aim at becoming one of the world's top campuses in research, higher education, and high tech. Leti and the recent development of Minatec, a centre for innovation in micro- and nano-technology, only increases Grenoble's position as a European scientific centre. 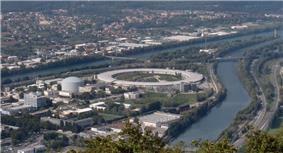 Other research centres in or near Grenoble include the European Synchrotron Radiation Facility (ESRF), the Institut Laue-Langevin (ILL), the European Molecular Biology Laboratory (EMBL), and one of the Commissariat à l'Énergie Atomique (Nuclear Energy Commission)(CEA) main research facilities. The city is now an important university centre with over 60,000 students, of which 16% arrive from abroad. Campuses of the École nationale de l'aviation civile (French civil aviation university), École d'Architecture de Grenoble ( School of Architecture of Grenoble) and Grenoble École de Management (management and business administration) are also located in Grenoble. In 1968, the university relocated to a main campus outside of the city in Saint Martin d'Hères (with some parts in Gières). However, smaller campuses remain downtown and in the northwestern part of the city known as the Polygone Scientifique ("Scientific Polygon"). The large community of both foreign students and foreign researchers prompted the creation of an international school. The Cité Scolaire Internationale Europole (CSI Europole) was formerly housed within the Lycée Stendhal across from the Maison du Tourisme, but later moved to its own building in the Europole (fr) district. In the centre of the city, two schools have provided education to the isérois for more than three centuries. The oldest one, the Lycée Stendhal, was founded in 1651 as a Jesuit College. In 1673 an astronomical and astrological sundial was created in the main building of the college, called "horloge solaire", which still can be visited today. The second oldest higher education establishment of Grenoble is the Lycée Champollion, completed in 1887 to offer an excellent education to both high school students and students of classes préparatoires. Located in the Place Saint-Laurent, the collections come from the archaeological excavations done on the site and are dated throughout the 3rd century AD. Situated on the right bank of the Isère, Grenoble Archaeological Museum presents the vestiges permitting to carry up the time until the origins of Christianity. 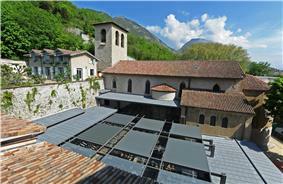 The museum is situated under a Benedictine church of the 12th century. Discovered in 1803 by Jacques Joseph Champollion-Figeac, brother of the egyptologist Jean-François Champollion, the Roman church is one of the first monuments classified in France thanks to the intervention of Prosper Mérimée, historic monument inspector. Since 1978, a systematic excavation has led Loud in the setting of a regional research program on the evolution of the churches during the Middle Ages. After eight years of work, the museum opened 6 May 2011. The city's most prized museum, the Andy Warhol. The museum also presents Egyptian antiquities as well as Greek and Roman artifacts. The Sculpture collection presents works by Auguste Rodin, Matisse, Alberto Giacometti and Alexander Calder. In April 2010, the prophetess of Antinoe, a 6th-century mummy discovered in 1907 in the Coptic necropolis of Antinoe in Middle Egypt, returned to the Museum of Grenoble, after more than fifty years of absence. This palace was constructed Place Saint Andre, around 1500 and extended in 1539. It was the location of the Parlement of Dauphiné until the French Revolution. It then became a courthouse until 2002. The left wing of the palace was extended in 1897. Palace of the Parliament of Dauphiné. Since 1934, the Bastille has been the destination of the "Grenoble-Bastille Cable Car". This system of egg-shaped cable cars known to locals as "Les Bulles" (the bubbles) provides the occupants with an excellent view over the Isère River. At the top are two restaurants and a small military museum on mountain troops (Musée des troupes de montagne). Although the Bastille was begun in the Middle Ages, later years saw extensive additions, including a semi-underground defense network. The Bastille has been credited as the most extensive example of early 18th-century fortifications in all of France and then held an important strategic point on the Alpine frontier. The Bastille, an ancient series of fortifications on the mountainside overlooking Grenoble on the northern side is visible from many points in the city. The Bastille is one of Grenoble's most visited tourist attractions and is a good vantage point over the town below and the surrounding mountains. Historically, both Grenoble and the surrounding areas were sites of mining and heavy industry. Abandoned mills and factories can be found in small towns and villages, and a few have been converted to tourist attractions, such as the coal mine at La Mure. Except for a few houses on the slopes of the Bastille hill, Grenoble is exclusively built on the alluvial plain of the Isère and Drac rivers at an altitude of 214 metres (702 ft). As a result the city itself is extremely flat. Mountain sports are an important tourist attraction in summer and winter. Twenty large and small ski resorts surround the city, the nearest being Le Sappey-en-Chartreuse, which is about 15 minutes' drive away. In 1968 Grenoble welcomed the Xth Olympic Winter Games. This event helped modernize the city with the development of infrastructure such as an airport, motorways, and a town hall. It also helped develop new ski resorts like Chamrousse, Les Deux Alpes, and Villard-de-Lans. In September 1943, German troops occupied Grenoble, escalating the conflict with the clandestine movements. On 11 November 1943 (the anniversary of the Saint-Bartholomew". From these events, Grenoble was styled by the Free French Forces the title of Capital of the Maquis on the antennas of the BBC. The economic development of the city was highlighted by the organization of the Parc Paul Mistral after the death of the mayor in 1932. 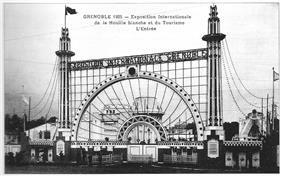 The only building of this exhibition remaining in the park is the Tour Perret, which has been closed to the public since 1960 due to its very poor state of maintenance. In 1790, the Dauphiné was divided into three departments, and Grenoble became the chef-lieu of the Isère department. The city was renamed Grelibre and took back its real name only under Napoleon. Only two abbeys were executed at Grenoble during the Reign of Terror. Pope Pius VI, prisoner of France, spent three days at Grenoble in 1799 before going to Valence where he died. 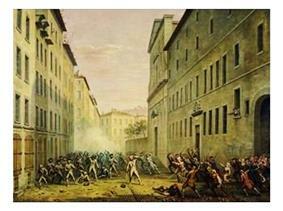 The city gained some notoriety on 7 June 1788 when the townspeople assaulted troops of Estates General, thus beginning the French Revolution. During the Revolution, Grenoble was represented in Paris by two illustrious notables, Jean Joseph Mounier and Antoine Barnave. Due to Grenoble's geographical situation, French troops were garrisoned in the city and its region during the Italian Wars. Charles VIII, Louis XII, and Francis I went several times to Grenoble. However, the people had to suffer from the exactions of the soldiers. At that time, Grenoble was a crossroads between Vienne, Geneva, Italy, and Savoy. It was the industrial centre of the Dauphiné and the biggest city of the province.